In the moment of this Summons, another anonymous production was sent into circulation, addressed more to the feelings and passions, than to the reason and judgment of the Army. The author of the piece, is entitled to much credit for the goodness of his Pen and I could wish he had as much credit for the rectitude of his Heart, for, as Men see thro’ different Optics, and are induced by the reflecting faculties of the Mind, to use different means, to attain the same end, the Author of the Address, should have had more charity, than to mark for Suspicion, the Man who should recommend moderation and longer forbearance, or, in other words, who should not think as he thinks, and act as he advises. But he had another plan in view, in which candor and liberality of Sentiment, regard to justice, and love of Country, have no part; and he was right, to insinuate the darkest suspicion, to effect the blackest designs. That the Address is drawn with great Art, and is designed to answer the most insidious purposes. That it is calculated to impress the Mind, with an idea of premeditated injustice in the Sovereign power of the United States, and arouse all those resentments which must unavoidably flow from such a belief. That the secret mover of this Scheme (whoever he may be) intended to take advantage of the passions, while they were warmed by the recollection of past distresses, without giving time for cool, deliberative thinking, and that composure of Mind which is so necessary to give dignity and stability to measures is rendered too obvious, by the mode of conducting the business, to need other proof than a reference to the proceeding. Thus much, Gentlemen, I have thought it incumbent on me to observe to you, to shew upon what principles I opposed the irregular and hasty meeting which was proposed to have been held on Tuesday last: and not because I wanted a disposition to give you every opportunity consistent with your own honor, and the dignity of the Army, to make known your grievances. If my conduct heretofore has not evinced to you, that I have been a faithful friend to the Army, my declaration of it at this time wd. be equally unavailing improper. But as I was among the first who embarked in the cause of our common Country. As I have never left your side one moment, but when called from you on public duty. As I have been the constant companion and witness of your Distresses, and not among the last to feel, and acknowledge your Merits. As I have ever considered my own Military reputation as inseparably connected with that of the Army. As my Heart has ever expanded with joy, when I have heard its praises, and my indignation has arisen, when the mouth of distraction has been opened against it, it can scarcely be supposed, at this late stage of the War, that I am indifferent to its interests. But how are they to be promoted? The way is plain, says the anonymous Addresser. If War continues, remove into the unsettled Country; there establish yourselves, and leave an ungrateful Country to defend itself. But who are they to defend? Our Wives, our Children, our Farms, and other property which we leave behind us. or, in this state of hostile separation, are we to take the two first (the latter cannot be removed), to perish in a Wilderness, with hunger, cold and nakedness? If Peace takes place, never sheath your Swords Says he until you have obtained full and ample justice; this dreadful alternative, of either deserting our Country in the extremest hour of her distress, or turning our Arms against it, (which is the apparent object, unless Congress can be compelled into instant compliance) has something so shocking in it, that humanity revolts at the idea. My God! what can this writer have in view, by recommending such measures? Can he be a friend to the Army? Can he be a friend to this Country? Rather, is he not an insidious Foe? Some Emissary, perhaps, from New York, plotting the ruin of both, by sowing the seeds of discord and separation between the Civil and Military powers of the Continent? And what a Compliment does he pay to our Understandings, when he recommends measures in either alternative, impracticable in their Nature? But here, Gentlemen, I will drop the curtain, because it wd. be as imprudent in me to assign my reasons for this opinion, as it would be insulting to your conception, to suppose you stood in need of them. A moment’s reflection will convince every dispassionate Mind of the physical impossibility of carving either proposal into execution. There might, Gentlemen, be an impropriety in my taking notice, in this Address to you, of an anonymous production, but the manner in which that performance has been introduced to the Army, the effect it was intended to have, together with some other circumstances, will amply justify my observations on the tendency of that Writing. With respect to the advice given by the Author, to suspect the Man, who shall recommend moderate measures and longer forbearance, I spurn it, as every Man, who regards that liberty, and reveres that justice for which we contend, undoubtedly must; for if Men are to be precluded from offering their Sentiments on a matter, which may involve the most serious and alarming consequences, that can invite the consideration of Mankind, reason is of no use to us; the freedom of Speech may be taken away, and , dumb and silent we may be led like sheep, to the Slaughter. 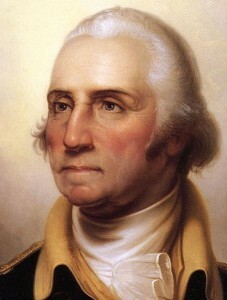 I cannot, in justice to my own belief, and what I have great reason to conceive is the intention of Congress, conclude this Address, without giving it as my decided opinion, that that Honble Body, entertain exalted sentiments of the Services of the Army; and, from a full conviction of its merits and sufferings, will do it compleat justice. That their endeavors, to discover and establish funds for this purpose, have been unwearied, and will not cease, till they have succeeded, I have not a doubt. But, like al other large Bodies, where there is a variety of different Interests to reconcile, their deliberations are slow. Why then should we distrust them? 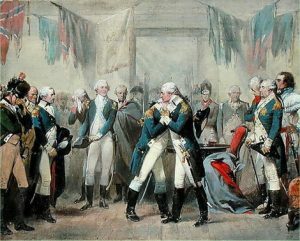 and, in consequence of that distrust, adopt measures, which may cast a shade over that glory which, has been so justly acquired; and tarnish the reputation of an Army which is celebrated thro’ all Europe, for its fortitude and Patriotism? And for what is this done? To bring the object we seek nearer? No! most certainly, in my opinion, it will cast it at a greater distance. For myself (and I take no merit in giving the assurance, being induced to it from principles of gratitude, veracity and justice), a grateful sence of the confidence you have ever placed in me, a recollection of the cheerful assistance, and prompt obedience I have experienced from you, under every vicissitude of Fortune, and the sincere affection I feel for an Army, I have so long had the honor to command, will oblige me to declare, in this public and solemn manner, that, in the attainment of compleat justice for all your toils and dangers, and in the gratification of every wish, so far as my be done consistently with the great duty I owe my Country, and those powers we are bound to respect, you may freely command my Services to the utmost of my abilities.